In Half Awake Half Asleep and the trilogy The Human Fly, Eva Teppe works with various modes of, at times, extremely decelerated motion. Here she did not use Super 8 film material, but turned to VHS cassettes with footage showing so-called base jumpers performing their skydives, which are officially banned. In The Human Fly the yellow-red outfit of a base jumper stands out brightly against the brown-grey rock of the cliffs, which in slow motion has blurred into a texture resembling the surface of water and against which the man seems almost to be hovering rather than plunging down. 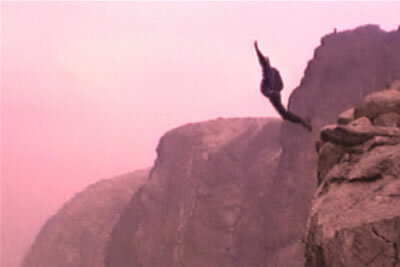 By thus manipulating the film’s speed the artist dispels all sense of the danger posed by such reckless leaps, while the base jumper is made to look like a diver gliding through a fluid biotope, giving the impression of a sleepwalker, as indeed the title Half Awake Half Asleep suggests. This mood is further heightened by the airy, floating soundtracks in both films which were composed by Mika Vainio. But what the films also evoke are associations with cinematic special effects such as those used in the Chinese action film Tiger and Dragon, where the colourfully costumed fighters overcome gravity and appear to lift off from the ground with feather-like ease. (Text: Ludwig Seyfarth. Excerpt from the catalogue “LONG VIEW”).